The story is generally pretty simple – the Fed is helping to steer stock prices via QE. And that idea is generally supported by vague charts showing a correlation between the Fed’s balance sheet and the S&P 500. More recently, this became a story about how the Fed caused a bond market panic. But earlier this year when discussions about the “taper” began, we started to see markets react oddly. The bond market sold off as the year progressed and the stock market just continued to shoot higher. This doesn’t mesh with the conspiracy theories about the Fed and stock prices. After all, if the rise in bond yields were due entirely to the “taper” then wouldn’t the same negative behavioral dynamics be impacting stock prices to some degree? But we haven’t seen any impact of the “taper” on equities. In fact, equities just continued to surge higher through all this discussion of the taper. So what is the explanation? How come bond yields have risen while stock prices have risen? Well, in my opinion, this is just another case of the fear trade losing out. The market is really an expectations game. If most people expect the economy and stock market to perform mediocre and it does slightly better than mediocre then you get a year like 2013 where stocks melt higher as things look better than expected. The rise in yields is also completely in-line with this thinking. That is, bond traders who expected yields of 1.6% to sustain themselves in an environment with 2% inflation have been wrong. CHART BATTLE ROYALE!! Is your chart tougher than Cullen’s, Bob? Bob I just want to point out that if you accept Fed signalling its future intentions is driving the stock market, and if you believe this is unsustainable growth, the implication is that there is a massive arbitrage opportunity on the market. If all that is true, can I sometimes stay in one of your many mansions you will buy from all the money you will make from this opportunity? Ryan, talk to Mark Spitznagel, he has more capital than me right now. He has made a bunch calling the last two drops, but he must just be lucky since by definition, nobody can ever have an opinion on the stock market. So if you always short the market, when the market goes down you make money. The question is by what rubric you would time buying the assets. Because if you always short, you will have lost a lot of money. And since Mark has not lost a lot of money, he is not always…. So he says. One would need to have a clear rubric to see whether or not such a rubric would have made money historically and if it does moving forward. For today – is it more like 2002 or 2007? How does one know? When do you know when to get out of the market? Too many heroic assumptions are needed here, especially since although there are certain wealthy Rothbardians, it’s not out of whack with the proportion of successful investors in other fringe groups. Spitznagel has written white papers, and now an entire book, on the specific metrics he uses. Maybe he’s right, maybe he’s wrong, but for you to say, “Well if you believe that, you should be rich” is weird, since he is in fact rich because of past successful speculation. EMH is readily falsifiable. The hedge fund that beats it over time still doesn’t exist. Why do you mention Spitznagel? He certainly isn’t the most well know finance person on this margin. Why him and not Schiff? The main problem with your thesis is that even though a period of growth is unsustainable, any correction would require human learning, which we cannot predict a priori, and not only that, but we can’t predict whether or not any collapse would be accompanied by large scale monetary and price inflation, in which case any shorts or puts would expire worthless, despite the fact that one is correct about the underlying real economy. Ryan, you seem to believe that prevailing market prices are exactly equal to prevailing values. But we already know that they can and do diverge. Look up the Grossman-Stiglitz paradox. Then look at the multiple at the beginning of the time series. No Tennessee, it’s not the fed. Graph profit margins against the Fed, and year over year eps growth against the Fed. Then get back to me. Because profit margins have no relation to Fed activity…? As they say on the internet, “Oh my ghey”… is Cullen Roche really this schizo? And it was just a few days ago he blackballed ABCT and the “ideological” Austrian school… but now he’s embracing their theory in the form of a Blackstone commentary? I’ve read a tiny bit of his articles that get posted on Seeking Alpha. From what I can gather, he actually does agree with a lot of Austrian Economics, and he just has not realized it yet. Most of his complaints towards AE are really just personal misunderstandings. For instance, the “flawed loanable funds theory” he mentioned in that article referred to his belief that the Austrians think “people have to save in order to produce.” So he missed the distinction between sustainable and unsustainable growth. I think he also said something about his strategy involving a focus on monetary flows into sectors or something like that, which seems pretty darn Austrianesque. His complaint about economics masquerading as a science seems pretty dang Austrian as well. Exactly. He is clearly thoughtful enough about the issues to not get sucked in to crazy Marxism like Mosler’s followers (which, by the way, in conversations with Mosler, is increasingly perplexing because the more I get into it with him the more he agrees with me…) so I think he accepts more than he realizes and the parts he doesn’t are based off of mischaracterizations or confusions. Which happens. Just like how some people read Ayn Rand and think her philosophy is best embodied by Alan Greenspan or a guy who gets rich by defrauding people and then shooting any poor, starving orphan children that wander into his palace. Or something. I don’t know where people come up with that but they do. Yea. I wouldn’t spend too much time over there if I were you. The only thing different about MR is that it believes banks don’t lend out Excess Reserves, which they of course do. It also teaches the U.S. can’t default on its debt because it can just print more money. He also doesn’t understand QE. He’s a nice guy, and I still think he ends up becoming an Austrian 5 years down the line, but right now, he’s kind of a fraud. Cullen is a smart guy, but young and open minded. I’ve found him pretty agreeable on most things if you reach out to him. You might be able to lure him over to a more Austrian view. He’s a big time capitalist so there’s hope yet. Can you clarify the extent to which you reject empiricism in economics? Do you believe data can tell us nothing at all about economic propositions? If so, is your argument here and accompanying chart simply meant to persuade those of us who do think data is relevant, while you in your heart of hearts believe this graph tells us nothing? Or do you think this chart lends support to your assertion that QE is fueling stock prices? If you believe it does, then how do you reconcile this with your stated rejection of empiricism? I believe the answer would be that this chart should be considered strong evidence to those who DO adhere to empiricism. The evidence for those who don’t would be counter-factual based, which is never precise. thinkotherthings, an economic law or principle is something like, “Creation of money by the central bank that enters the loan market will make the interest rate lower than it otherwise would be.” That type of statement takes logical deduction, not empirical calibration. However, to say “the stock market has been driven by the Fed the last 5 years and is overvalued” is an empirical claim. That’s not Austrian economics per se. Now to be fair, in both posts from which these quotes are taken you do mention economic laws, but it is not at all clear that these statements refer only to economic laws and not to economic propositions more generally. And by the way, I think most credible economists who use empirical methods don’t dispute that foundational economic laws can be derived a priori: i.e., no one disputes that individuals act to achieve given ends with limited means, and respond to incentives given limited information. No one disputes that ceteris paribus, demand curves slope downward. But the points of near unanimous agreement are not where the interesting questions are. The vast majority of economic research seeks to answer more nuanced questions, questions that involve more moving parts (particularly when ceteris paribus violations are endogenous), and frequently care about the relative magnitudes of relationships between economic variables. These are the areas where most economists see value in the empirical approach. It’s not Austrian economics per se, but to be consistent with your previous claims, are you willing to argue that this proposition is entirely outside the scope of economics? Or to push you on this from the opposite perspective: Why shouldn’t you be able to reach the conclusion that Fed policy has been boosting asset prices purely from logical deduction, and therefore be compelled to admit that this graph should do nothing to increase anyone’s confidence in that assertion? *Even Sumner doesn’t dispute this, he just argues that NGDP expectations are much more important. If you want to follow the scientific method, empirical results require a control experiment. All of macroeconomics suffers from the problem that a control experiment is never used (worse: cannot be used), thus whatever result you get there is nothing to compare against. You ever heard the phrase, “Physics, Stinks, and Stamp Collecting,” well the macroeconomic data is not much more than stamp collecting, because every observation just is what it is, incomparable with other observations. The Austrians are willing to admit there’s a problem here, the Keynesians and other schools just put their heads down, refuse to see anything and barge on regardless. I think Misesians err in throwing the baby out with the bathwater. Sure economic data is noisy and you’ll never be able to control for everything (particularly in macroeconomics). But that doesn’t mean the data is entirely devoid of informational content – that it can’t tell us anything. While you can’t control for all other variables in the sense of holding them constant, you can account for them by including them in your model so that their impact does not get mistakenly attributed to your primary variable under study, and hence you can still get reasonable parameter estimates from appropriately specified models. Most economists, regardless of their background, recognize the limitations inherent in economic data, at least to the extent I have laid out in this post. Everyone understands that macroeconomic theories cannot be subjected to controlled experiments. But that doesn’t mean they can’t be tested at all, in the sense of comparing how well competing theories can explain the data. And Tel, just to be clear: You believe that this chart Bob posted in no way supports his assertion that Fed policy has been fueling the recovery? That it should do absolutely nothing to persuade any rational person of the veracity of his claim? Where some economists go wrong is they think that the empirical analysis serves not to measure the magnitude of an effect but also to prove that the effect exists in the first place. This is as mistaken as a physicist measuring the mass of an object and thinking he is not only measuring the mass of a specific object, but also investigating whether or not matter really has mass at all. Economists are sometimes accused of trying to imitate the natural sciences but the type of mistake that provokes this accusation is really something that most practitioners in the natural sciences don’t do because they recognize it as inappropriate in their own fields. Careful, James. I would argue that it is inappropriate to talk about “the” Austrian view on empirical analysis, as I think there is substantial disagreement on this point. I am aware that many Austrians do not reject empirical analysis outright, but many others do. Including Bob Murphy – or at least his previous posts have implied as much. Statistics is a method for the presentation of historical facts concerning prices and other relevant data of human action. It is not economics and cannot produce economic theorems and theories. The statistics of prices is economic history. There is no such thing as quantitative economics. The idea that changes in the purchasing power of money may be measured is scientifically untenable. Statistics is the description in numerical terms of experiences concerning phenomena not subject to regular uniformity. . . . Statistics is therefore a specific method of history. As there are in the field of social affairs no constant relations between magnitudes, no measurement is possible and economics can never become quantitative. All monetary policies encounter the difficulty that the effects of any measures taken . . . can neither be foreseen in advance, nor their nature and magnitude be determined even after they have already occurred. The last quote being especially pertinent to Bob’s initial post on the QE-S&P relationship. Misesians must concede then that all of your sample questions – and the majority of questions addressed by academic and professional researchers within the discipline – fall outside the bounds of economics. Thanks for pointing out that there is some diversity of belief among Austrians on empirical work. I didn’t mean to suggest that Austrian economists had a unanimous consensus on any particular subject. I wonder if anyone actually thought I was saying that. Anyway, I’m aware of those quotes from Mises. This was not his best thinking. This just doesn’t follow: “As there are in the field of social affairs no constant relations between magnitudes, no measurement is possible and economics can never become quantitative.” Constant relations between magnitudes are not a necessity for measurement. As to whether or not statistical analysis of economic history is a subset of economics or not, I’m happy to let the Misesians call it what they want. They can call it “applesauce” if they like. What difference is it supposed to make? I didn’t mean to suggest that Austrian economists had a unanimous consensus on any particular subject. I wonder if anyone actually thought I was saying that. Well, you suggested that I misunderstood the Austrian view. I simply wanted to point out that the view I described (which, by the way, in my initial post I only attributed to Bob Murphy specifically) in fact accurately characterizes a substantial number of self-proclaimed Austrians. And you also said that “there is no Austrian prohibition on using empirical data to answer questions like … “ For Misesians, there is, as evidenced by the quotes I listed above. The problem isn’t so much that Misesians don’t label it economics, but that they regard statistical/empirical methods as being entirely illegitimate for drawing inference in economics. They believe that economic history is of no use in assessing the validity of economic theories or in forecasting the future. Now, Bob Murphy seems to have softened his stance, but that hard rejection of empiricism is certainly the position he communicated in his series of lengthy posts from earlier this month when he called empirical economics “bankrupt” and the scientific method “a fruitless approach”. For at least the past 6 months, bad economic data has continued to drive the market up — the worse the news, the more intervention expected, and stocks climb. Lots of people wanting to try and time the top and get out before the taper. Bad news is the new good news. These are perverse times. The stock market is not an indicator of the state of the overall economy. Stock prices reflect corporate profits. Joe, Stock prices reflect more than just corporate profits. For example, fluctuations in multiples, money stock flows, etc. No, if fed assets were driving the S&P then the there would be a lag between a rise in Fed assets and the S&P. Compare corporate profits and the S&P. The S&P lags corporate profits so corporate profits are driving the S&P. Lol at him saying it had little effect on the amount of currency in circulation. This is fun. 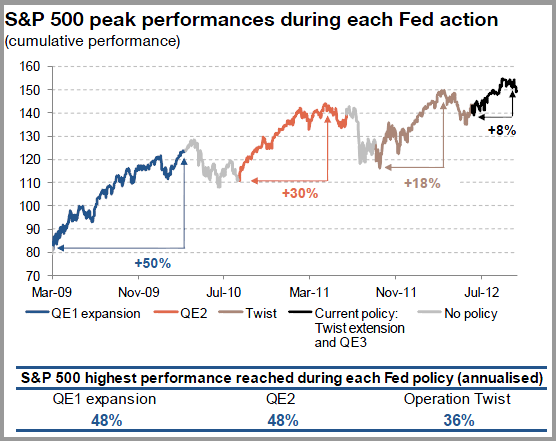 Couldn’t we say that expecations of Fed QE lead S&P 500? Leads and lags always make for interesting discussions! Announcements played a big role. Yes, lead/lag is always an interesting discussion.